According to the World Health Organisation (WHO), around 15% of the global population, or an estimated 1 billion people, live with disabilities, and 80% of this PwD (Persons with Disabilities) population resides in developing nations. It is also estimated that 6% of India’s population (roughly 72 million) suffers from some form of disability or the other, and notably only around 3-4 million of these are educated. Without doubt, the disabled represent the world’s largest minority. 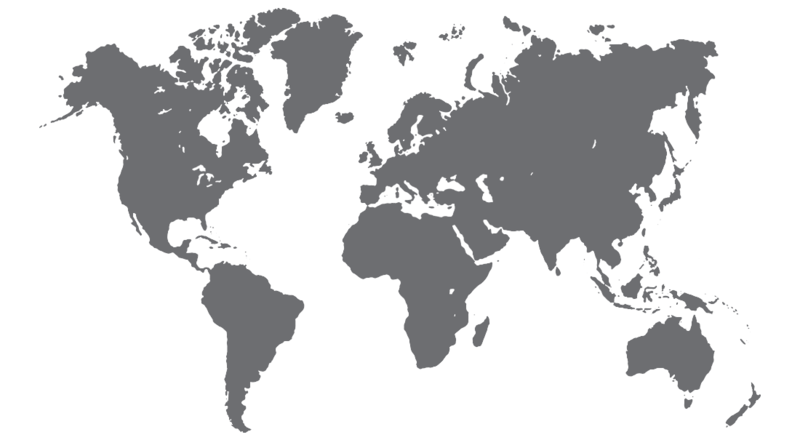 However, there is a key geographical difference here – 90% of children with disabilities in developing countries like India do not attend schools and are grossly under-represented in higher education, whereas in the developed nations of Europe and the US, the disabled are mainstreamed in education. For example, in the UK, PwDs undergoing higher education are eligible to receive a generous Disabled Students’ Allowance, irrespective of their financial status. In undergraduate courses too, PwDs are provided a number of other monetary benefits such as Disability Living Allowance, Personal Independence Payment, Income-Related Employment and Support Allowance, Housing Benefit, Tax Credits and Universal Credit. Similarly, in the US, most top universities provide need-based financial aid and generous fee waivers to PwD students. Such empowerment of students with disabilities to ensure a level-playing field is missing in India. So, the question arises: “Why are PWDs in India broadly unrepresented in even elementary education, let alone higher education and employment?” The answer lies in our socio-cultural fabric. Denial of equal opportunity for PwDs emanates from the social stigma that exists – so much so that in many cases the disability is hidden and unreported. Some root causes include non-accessibility of educational material; unfriendly infrastructure in transport, colleges and workplaces; absence of relevant education policy and schemes; and widespread apathy in the society and the state at large. This was demonstrated by the Supreme Court’s recent frustration over several states not showing any progress in the implementation of various provisions of the Persons With Disabilities (Equal Opportunities, Protection of Rights and Full Participation) Act, 1995. 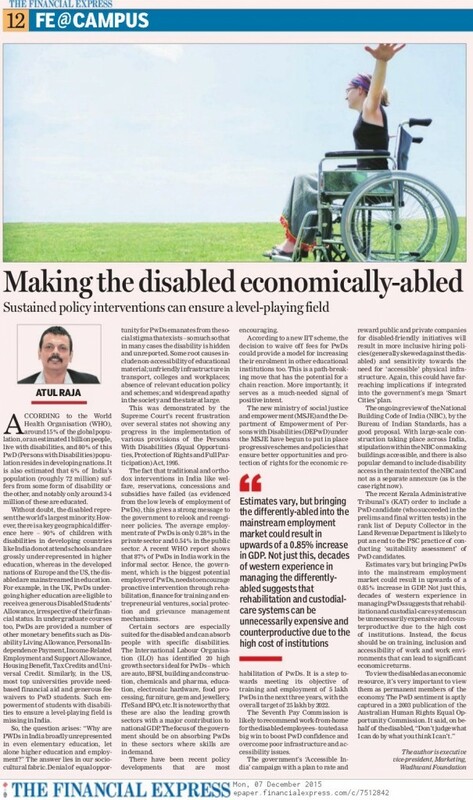 The fact that traditional and orthodox interventions in India like welfare, reservations, concessions and subsidies have failed (as evidenced from the low levels of employment of PwDs), this gives a strong message to the government to relook and reengineer policies. The average employment rate of PwDs is only 0.28% in the private sector and 0.54% in the public sector. A recent WHO report shows that 87% of PwDs in India work in the informal sector. Hence, the government, which is the biggest potential employer of PwDs, needs to encourage proactive intervention through rehabilitation, finance for training and entrepreneurial ventures, social protection and grievance management mechanisms. Certain sectors are especially suited for the disabled and can absorb people with specific disabilities. The International Labour Organisation (ILO) has identified 20 high growth sectors ideal for PwDs – which are auto, BFSI, building and construction, chemicals and pharma, education, electronic hardware, food processing, furniture, gem and jewellery, ITeS and BPO, etc. It is noteworthy that these are also the leading growth sectors with a major contribution to national GDP. The focus of the government should be on absorbing PwDs in these sectors where skills are in demand. There have been recent policy developments that are most encouraging. According to a new IIT scheme, the decision to waive off fees for PwDs could provide a model for increasing their enrolment in other educational institutions too. This is a path-breaking move that has the potential for a chain reaction. More importantly, it serves as a much-needed signal of positive intent. The new ministry of social justice and empowerment (MSJE) and the Department of Empowerment of Persons with Disabilities (DEPwD) under the MSJE have begun to put in place progressive schemes and policies that ensure better opportunities and protection of rights for the economic rehabilitation of PwDs. It is a step towards meeting its objective of training and employment of 5 lakh PwDs in the next three years, with the overall target of 25 lakh by 2022. The Seventh Pay Commission is likely to recommend work-from-home for the disabled employees– touted as a big win to boost PwD confidence and overcome poor infrastructure and accessibility issues. The government’s ‘Accessible India’ campaign with a plan to rate and reward public and private companies for disabled-friendly initiatives will result in more inclusive hiring policies (generally skewed against the disabled) and sensitivity towards the need for ‘accessible’ physical infrastructure. Again, this could have far-reaching implications if integrated into the government’s mega ‘Smart Cities’ plan. The ongoing review of the National Building Code of India (NBC), by the Bureau of Indian Standards, has a good proposal. With large-scale construction taking place across India, stipulation within the NBC on making buildings accessible, and there is also popular demand to include disability access in the main text of the NBC and not as a separate annexure (as is the case right now). The recent Kerala Administrative Tribunal’s (KAT) order to include a PwD candidate (who succeeded in the prelims and final written tests) in the rank list of Deputy Collector in the Land Revenue Department is likely to put an end to the PSC practice of conducting ‘suitability assessment’ of PwD candidates. of institutions. Instead, the focus should be on training, inclusion and accessibility of work and work environments that can lead to significant economic returns.